Step in Safely. Bathway converts your existing bathtub into a safe and accessible step-in shower, in just over an hour. 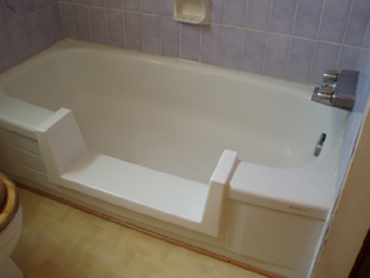 Fast, affordable and without the mess and expense of a renovation, Bathway cuts away a section of your tub and installs a custom-fit threshold. It's that simple. For anyone looking for a quick and economical alternative to messy, disruptive and costly bathroom renovation, Bathway is the answer. "I was constantly worrying about my mother living alone in her home, and the bathroom was a particular concern. Bathway's accessibility solution has made life much easier and safer for her and given me some piece of mind." For many seniors, aging in place allows them to maintain dignity and independence while enjoying the comforts of remaining in their own home.